Anti-two block device Standard anti-two block device, when activated, provides an audible warning to the crane operator and disengages all crane functions whose movement can cause two-blocking. Load indicator (wireless LSI) A simple, effective, and easy to use load moment indicating system used in conjunction with a wireless anti-two block system to assist the operator in efficient operation of the unit within the limits of the load chart. The display panel displays the hook load, length and angle of the boom, and load radius in Dot Matrix numerical values and provides a load utilization colored bar graph. If non-permitted conditions are approached the L.M.I. will warn the operator with an audible alarm and a warning light and will lock out those functions that may aggravate the condition. Standard limit settings can be programmed for boom Angle, load radius, and boom tip height. *Load moment indicator(hardwired LMI) "Graphics Display" of boom angle, boom length, load radius, and capacity. Operator input to set the limit parameters based on the load chart. Displays color coded light bar and audible alarm with function cut-out if load exceeds the load chart parameters. Hydraulic system Four section gear pump providing a system pressure of 241,3 bars (3500 psi) Combined flow: 333,1 Lpm (88.0 gpm) YB5515: Six-section valve bank mounted in dash with direct mechanical linkage for low effort lever control. Return line filter with full flow by-pass protection and service indicator. 151,4 L (40 gal) hydraulic reservoir with sight level gauge and steel side plating to guard against side impact damage. Frame High strength alloy steel constructed with integral outrigger housings; front and rear tie-down lugs. 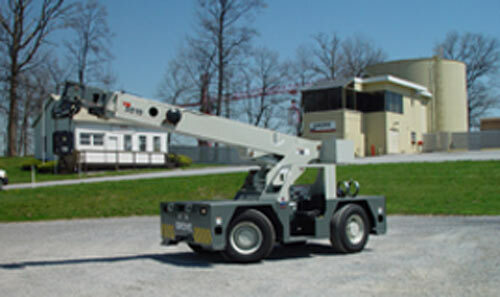 75 ft2 carrydeck size with 9072 kg (20,000 lb) carrying capacity. Deck coated with anti-skid treatment. Outriggers YB5515: Front and rear oblique type beams at all four corners with integral holding valves. Outrigger pads form an integral part of the beam. Outrigger pad size 222 mm x 254 mm (8.75 in x 10 in). Outrigger monitoring system (required for North America and Canada). Maximum pad load: 162 p.s.i. Outrigger controls Lever controls located on dash panel and operate the beams in pairs from side to side. Level bubble located inside operators compartment. *Independent outrigger controls available as an option. Dual Fuel engine (2007 EPA) G.M. 4,3 L V-6 EFI dual fuel (gasoline / L.P.) rated at 69,3 kW (93 bhp) at 2500 rpm. Operators control station Frame mounted, open air style control station with cab shell includes all crane functions, driving controls, and overhead safety glass. Other standard equipment include a durable weather resistant seat with seat belt, hourmeter, sight level bubble, and fire extinguisher. The dash panel includes engine oil pressure gauge, engine water temperature gauge, fuel gauge, transmission low oil and high temperature warning lights, low battery warning light, and brake system low pressure warning light. The LSI (load indicator) receiver is mounted to the top of the dash. *Operators control station enclosed Includes the standard cab shell with the addition of front, right, and rear glass, a split (two-piece) hinged door with sliding glass. Front windshield wiper, heater and defroster fan are included. Fuel tank capacity 151,4 L (40 gal) all steel construction with steel side plate to guard against side impact. Electrical system One 12V maintenance free battery, 820CCA @ 0°. 63 amp alternator. Drive 4 x 2 - Front axle drive with planetary hubs and limited slip differential. Transmission I.T.L. synchromesh four-speeds forward and reverse. Brakes Hydraulic actuated internal wet-disc service brakes acting on all four wheels. A dash mounted toggle switch activates the dry disc parking brake on the transmission output yoke with a dash warning light. Suspension Front: Rigid mounted to frame. Rear: Provides 1.5° oscillation for use on semi-rough terrain. Axle lock-out must be engaged (locked) whenever picking on rubber or traveling in the crab steer mode. A warning light indicates when the axle lock-outs are engaged. Lights Recessed mounted, includes head, tail, rear work, stop, and turn signals.